Cookbook Review: The Looneyspoons Collection, Simply Orange Chicken and a Giveaway! 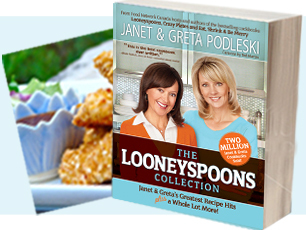 Before the holidays, I was contacted by Hay House and asked if I would be interested in doing a review of the cookbook, The Looneyspoons Collection by Janet and Greta Podleski. (Disclaimer: I was not paid to endorse or write a review for this cookbook. The opinions expressed are entirely mine.) Once the publisher emailed me a couple of sample recipes from the book, I was anxiously awaiting it's arrival. I have to admit, I was not familiar with the sister duo of Janet and Greta Podleski, but I know all of my Canadian readers will know who they are. Janet and Greta are authors of three #1 bestselling cookbooks: Looneyspoons, Crazyplates, and Eat, Shrink and be Merry. The books are best known for their unique combination of "great tasting, healthy food, useful nutrition tips, and corny humor." And if that isn't enough, over the years, the sisters have found time to host a show on Food Network Canada, develop a line of healthy prepared foods, produce monthly columns for Reader's Digest and Taste at Home magazines, and create a line of grEATing cards for Hallmark. Wow!! Janet and Greta's latest book, The Looneyspoons Collection, is a masterpiece every health- conscious, diet-minded person needs to own! It's jam-packed with more than 325 "I can't believe these are healthy!" recipes. The recipes have all been given whitty names like "Steak it Up, Baby" (Grilled tuna steaks with a delicious chili-lime marinade) and "A Bundt in the Oven" (Blueberry streusel coffee cake). How fun is that?? The cooking directions are easy to follow and, for the most part, all of the recipes use easy to find, simple ingredients. All recipes have a complete nutrition analysis, so you can calculate out WW Points+, if you like. You will also find hundreds of beautiful full color photos, volumes of weight-loss, anti-aging, and healthy living tips scattered throughout the nearly 400 page book. As a wonderful bonus, you will also enjoy the jokes that made this pair's cookbooks famous! I wanted to wait until after the holidays to do this review and present you with one (or more!) of the recipes out of the book. Let me tell you, I have made several recipes and I have not been disappointed by any of them. I waited because I wanted to give this GREAT book the post it deserved!! One of the very first recipes I made from this book was Simply Orange Chicken. The only swap I made from the original recipe is that I used a grainy brown mustard in place of the honey-dijon. I did this because that is what I had on hand. I was afraid this might be a dish my husband would turn his nose up at...remember how he hates "sweet" with his meat? Well...even HE loved it. The WW Points+ for this dish worked out to be 7 Points+. Leave me a comment on this post telling me what part of this fantastic cookbook makes you want to own it for yourself! 3. "Like" Hay House on Facebook and leave me a comment telling me you did so. 4. "Like" Janet and Greta Podleski on Facebook and leave me a comment telling me you did so. * I MUST be able to contact you to let you know you have won and so that your prize can be delivered. If you do not have a blog that shows a contact email I can contact you on, please include an email in your comment and a name( you can write out the (at) and the (dot) to help avoid getting spam) or send me your email address through my email ( mykitchenadventures (at) yahoo (dot) com) and let me know who you are and which comment is yours. Anonymous comments will NOT be included in the contest, UNLESS somewhere in the comment you have left me a name and contact information. Contest is open to all US and Canadian residents. ( sorry to anyone not eligible ) Any comment that does not meet the above criteria will be disqualified. This giveaway will end on Thursday, February 7, 2013 8pm EST. Winners will be chosen at random and will be announced either that night or the following day. Winners must claim their prize within 24 hours of notification, or a new winner may be chosen. You can also order this book from various sources including amazon and barnes&noble. Go HERE to find out how to order one today for yourself! I cannot tell you how much I am enjoying this cookbook. From the beautiful photos to the great tips this is a MUST own book. I think I currently have 10 pages bookmarked for recipes I want to try and I have made the Simply Orange Chicken twice already! And... I am so excited that my Canadian friends can join in the fun with this giveaway too! The fact that the recipes are healthy and include nutritional information is what I'm most excited about. That orange chicken looks delicious! I am following Janet and Greta on facebook. Thank you so much for sharing! I'm definitely going to be getting my hands on the cookbook. And let me just tell you - I absoluteoy love your blog. It's fun and full of the greatest recipes - my husband's personal favorite is the Salisbury Steak! That's become one of our weekly meals. And congrats on your nomination for best food blogger. This may sound silly, but I like the little cartoon photos that go along with the recipes! Something different:) And I've never heard of this duo, so I'd love to check them out! I would like the recipes along with their sense of humor. A cookbook and humor together...awesomeness! I am following your MKA page on facebook. Always love finding new cookbook authors to collect...The healthy recipes is a big draw, as well as the weight loss and other beauty tips. Wonderful giveaway! I love the name of this chicken. Too funny we both posted "simple" orange chicken dishes so close together! I'd like this cookbook simply b/c it has healthy recipes in it and I'm trying to lose weight right now. Finding meals that are just as good as high-cal meals is a challenge and it sounds like this cookbook could help me out! That chicken looks AMAZING and is easily a reason I would love this cookbook! I liked Janet an Greta and know will be following them. I follow MKA via facebook! You rock Renee! I shared the Cookbook give away on my Facebook home page. This book is cute and practical. I don't know if I like the cheesy cartoons and recipe names or the nutrition tidbits on nearly every page! I'd love to have the book so I could decide. I love new cookbooks especially ones that I know will have recipes I will use. I joined your MKA facebook page. I liked hayhouse and Janet and Greta! These are my favorite cookbooks! I want to win!!! I have never heard of them...looks like a fun book! I would love this cookbook. Just recently found out I have a wheat sensitivity, so I'm looking forward to healthy recipes that I can tweak to my diet. I liked the publisher on facebook. Thank you for the review of this cookbook. Sounds like a good one! I have heard of them and seen some of their recipes floating around on other blogs. I like cookbooks that include photos of the recipes and nutritional information. The orange chicken looks and sounds wonderful. I love that this cookbook has the nutritional information.That makes it so easy to calculate the points plus values! I posted a short tweet about your cookbook giveaway! Ooh, this would be an awesome book. Healthy food, good food, and some funnies! DH and I lost some weight a few years ago but we're always struggling to stay on track but find new and exciting recipes to help us. This would be great! I would like to have this cookbook for the healthy recipes. I like having the nutritional info for the recipes.